Sitting down to write your company’s first press release is never an easy job to undertake. You might be excited about writing one, but it’s only when you’re confronted by that blank white page that your mind goes blank. Not to worry. In this article, we are going to cover the basics of how to write your company’s first press release so that it’s perfect for publication. It shouldn’t have to be mentioned, but to begin you should have extensive knowledge of your company and any recent ‘newsworthy’ events. Once you have that, you’re ready to get started. Grand Opening: This is the most obvious company press release idea. Your company is finally opening its physical or virtual doors and, on this particular date, you will be open for business. Sale or Promotion: People love to save money. That’s why sales and promotions are common press release subjects. Tell your audience where they can go save some dough and they’ll be sure to reward you with more sales. New Promotions or Hires: Did you recently hire a new marketing director? Did someone just get bumped up to Vice President of your organization? Your readers might want to know what’s going on internally at your company. For consumers of your products and services, it’s good news that things are happening inside. It means big things are coming on the horizon. Company Expansion: Did your company acquire new land or a new building? Or maybe your company merged with another? Again, your consumer base will enjoy learning more about your company’s success. It means they’re making good buying decisions and that the products and services you provide can only get better. Product or Service Release: Do you have a new great invention that you can’t wait to tell your audience about? Do you have a service that will have your audience begging for more? These are great company press release subjects. Get your consumer base excited for what’s to come. Website/Blog/Newsletter/Social Media: Let your audience know where they can go to find out more about your company and/or products and services. Your press release could alert your audience to your newsletter and your subscriber opt-in form, thus expanding your marketing reach. You could let your audience know that you have a new and improved website or that your blog is live and is ready to be published weekly. Your audience may not know that you have a Facebook page. Let your audience know where to go to learn more and they’ll probably go there. By now you should have plenty of information to write about. Reading the above information, you may have two or three subjects you might like to turn into a press release. Once you have your subject, your next step is to write an engaging and SEO friendly title. Your press release title should be one that gets your reader’s attention. If your company press release is about a new hire, you might say, “Your Business Name Hires New Marketing Director and Promotes VP of Operations” – you get the idea. If at all possible, for the purpose of SEO, try to put your keywords as close to the beginning of the release as possible. This will make sure your press release ranks prominently ahead of other releases you may be competing against. Most press release sites require a short description of the piece you plan to publish. Make this engaging, as your description is often the blurb readers get when they’re browsing through company press releases to read. As you write your press release, think like a news reporter. Write in an editorial format and keep all emotion out of it. Just present the facts in the most interesting way possible. Make every word in every sentence count and remove all superfluous words and fluff. And make sure your paragraphs are kept short. This will keep your reader’s eyes flowing down the page. At the end of your press release, right before you list your contact information, you will want to tell your readers where to go for more information. This is your call-to-action and it should be present on all company press releases. You can simply say, “Go to http://yoururlhere.com/ for more information.” Get creative with it and be different. If your press release is good, your audience will click whatever link you leave for them. That is how to write your first company press release. Once it’s ready, start publishing it to online and offline press release directories for more links, more traffic and far more exposure than you ever had before. 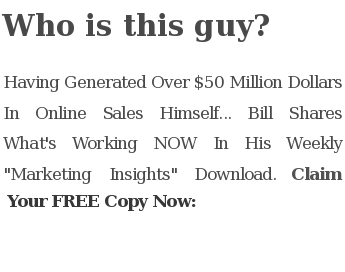 This entry was posted in Online Marketing and tagged company press release, press release by Bill. Bookmark the permalink.